We have both Beechey ground squirrels and Oregon ground squirrels (Citellus beldingi) near our home. Although both types of ground squirrel are active here in the spring and early summer, Oregon ground squirrels begin their winter hibernation in late July or early August leaving Beechey ground squirrels as the only ground squirrels visible throughout fall. The Beechey ground squirrel (Otospermophilis beecheyi) is also commonly known as a California ground squirrel. Beechey ground squirrels have bushy tails, a buff belly and brown/grey upper parts flecked with white or buff. I was surprised to learn that some adult Beechey ground squirrel populations in California have varying resistance to rattlesnake venom. Rattlesnakes are a primary predator of ground squirrels. Spermophilus was the former name for Beechey ground squirrels. This Beechey ground squirrel was photographed at Ashland Pond in Ashland OR. 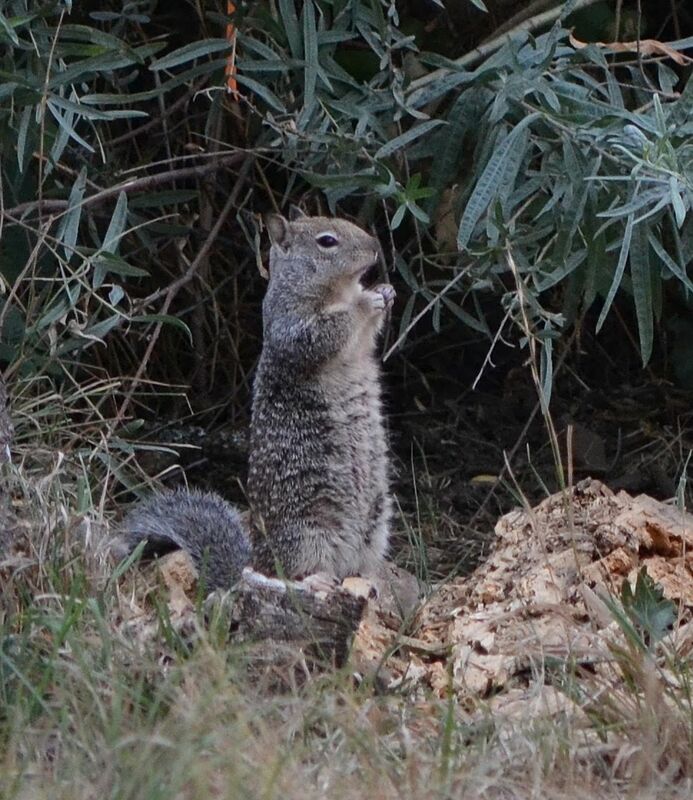 This entry was posted in Mammals and tagged Beechey ground squirrel, Belding ground squirrel, California ground squirrel, Citellus beldingi, nature photography, Oregon ground squirrel, Otospermophilus beecheyi, Spermophilus beechey. Bookmark the permalink.